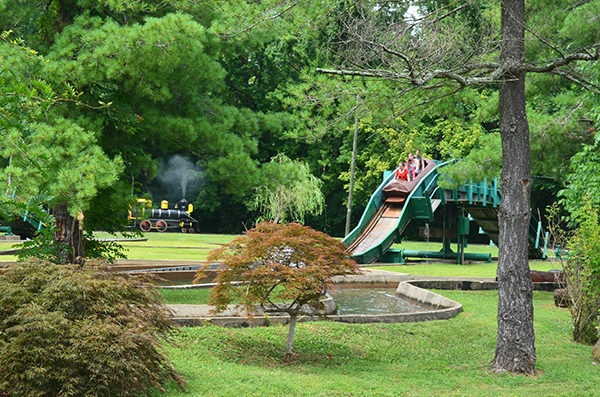 Recently we had the chance to spend an afternoon at Camden Park in Huntington, West Virginia! 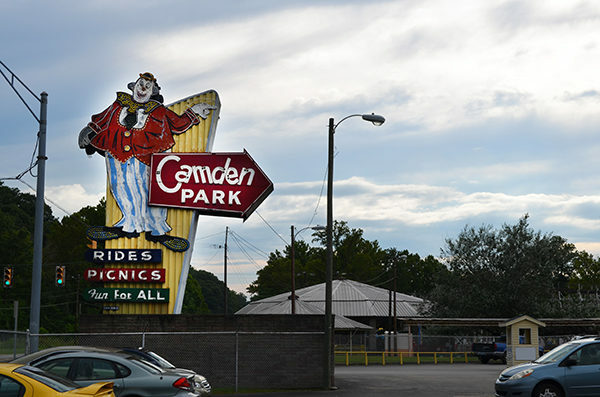 Camden Park originally opened as a picnic park in 1903 with rides being introduced in 1907. The slowly developing park had only six rides by 1920. It also survived a bad Ohio River flood in 1937 and a small fire in the 90’s. 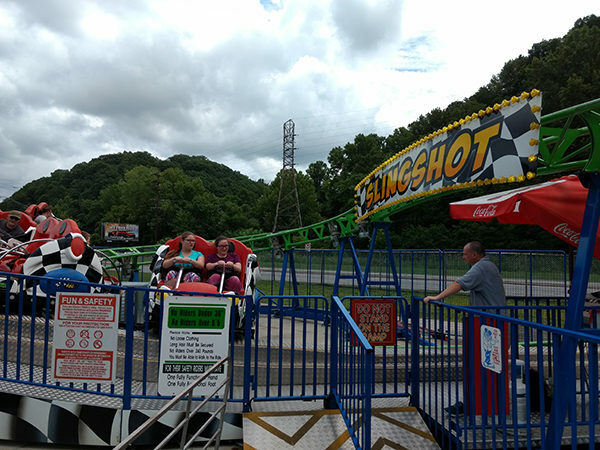 This small park is now home to over 30 rides, including West Virginia’s only two permanent coasters, which happen to be ACE Coaster Classics! 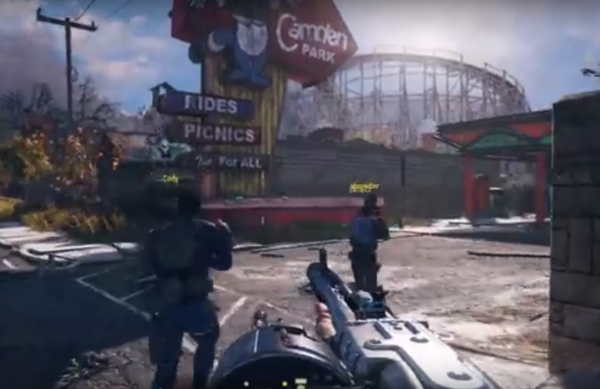 A land that will resemble Camden Park will be featured in the new Fallout76 game. Read more about it and watch the teaser here. I may have to purchase the game just for this! Apart from the lack of new paint, I was quite impressed with the landscaping efforts; there were a lot of flower beds and bushes scattered throughout the park that you could tell were well maintained. One of the hidden gems at the park is the Hawnted House (yes it’s spelled that way). 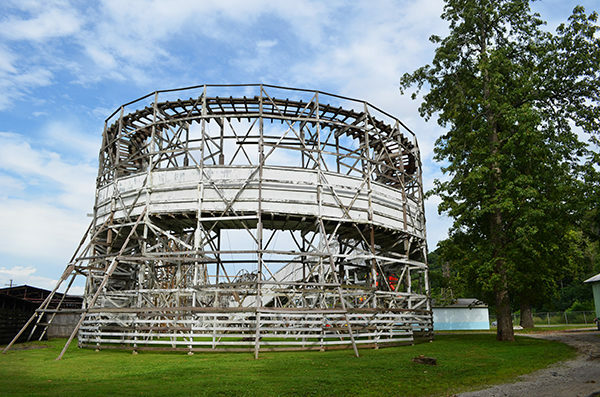 This is one of only two gravity-fed Pretzel rides still left in the United States, which means it is technically a roller coaster! 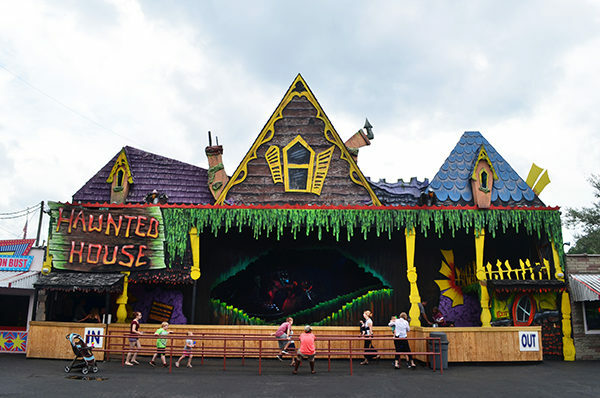 You are taken up about ten feet, then turn into little drop and go back up a hill into the dark part of the ride. How do you stop on this ride, you ask? The ride attendant catches you (see below)! What a classic, get here before it’s gone! 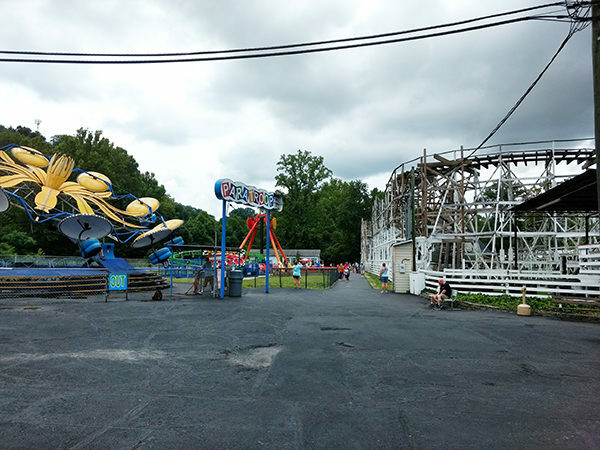 My favorite ride at the park is the Big Dipper (built in 1958 by National Amusement Devices). 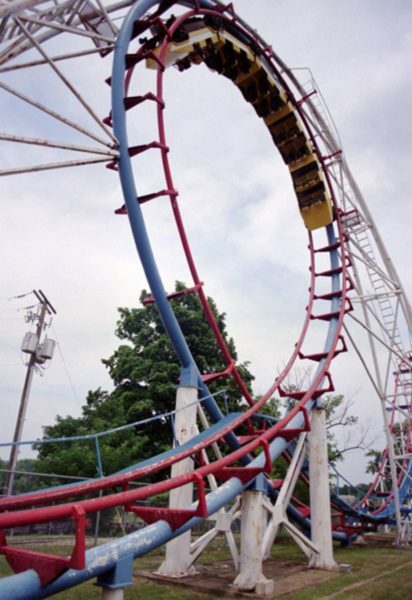 I remember riding this coaster over and over again as a kid. The Big Dipper has a double figure-eight design. I was sad to see that the large Big Dipper sign wasn’t hanging on the station anymore. You’d expect this coaster to be very rough, but it actually was quite enjoyable. 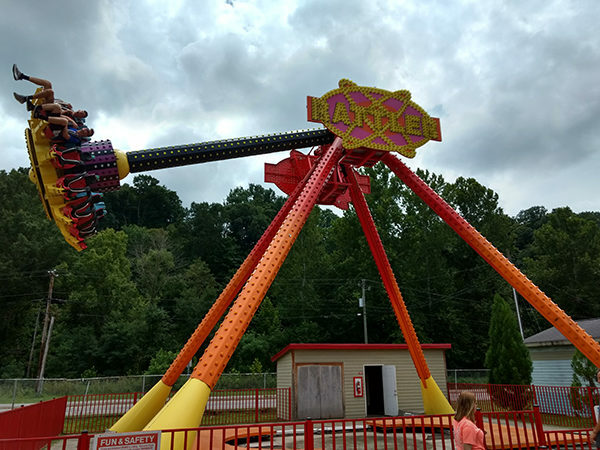 The “first” drop on the Big Dipper is a tease drop and only goes down a few feet. The second drop is the big one and you get a lot of airtime as you drop into it. I practically stood up as we dropped! There is also a long tunnel with two more airtime moments coming out of it. The ride op still uses a manual brake to slow you as you enter the station. 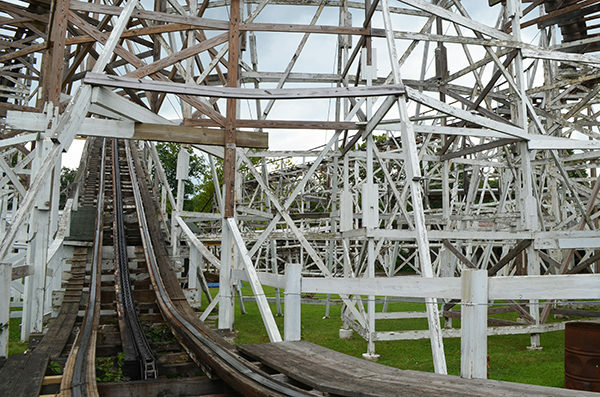 The Big Dipper’s counterpart, the Lil’ Dipper was built three years later and is a small double out-and-back coaster with steel supports and a wooden track. Both Dippers feature the classic Century Flyer trains. Unfortunately the Lil’ Dipper’s train has been painted with an outer space theme and the working head lights no longer work on the Big Dipper. The fourth and final coaster at the park is Slingshot, a SBF Visa Group spinning coaster. They don’t look like much, but I happen to enjoy these. The seats are quite small, however. 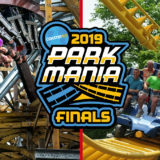 There are a lot of classics in the park as well: a carousel that is 111 years old, a Paratrooper, Tilt-a-Whirl, an original William F. Mangel Whip ride, and a children’s hand car ride to name a few. As for other attractions, there is a log flume, The Rattler (think miniature MaXair or Delirium), a train, swan boats, sky ride and a mini golf course. The mini golf course sits where Thunderbolt Express resided until 2004. This was an Arrow shuttle coaster that operated at the park from 1988 until 1999. 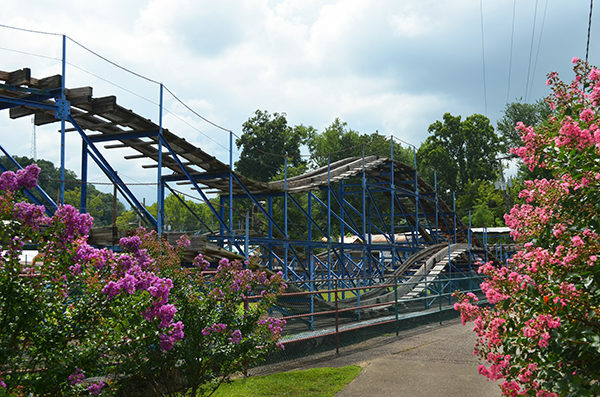 Before Camden Park bought the coaster, it was the Screamin’ Demon at Kings Island from 1977 to 1987. With a little work, Camden Park could be a very beautiful little family park. I’d love to see a new coaster be built here. 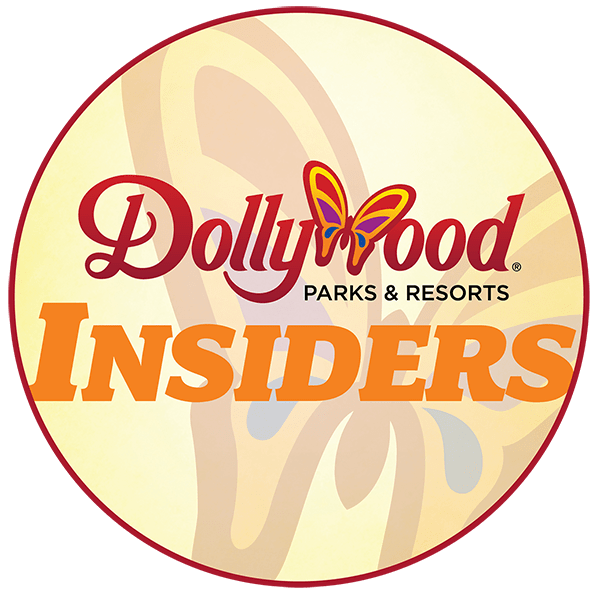 I think something like a Kentucky Rumbler, Lightning Run, or El Loco would do great at this park and really drive attendance up (and coaster enthusiasts in). I hope that this park continues to maintain their rides so others can come experience it for years to come. It really is like stepping back in time (and that is a good thing) when you come here. Sometimes you need that old small park experience! Have you had a chance to visit Camden Park? Tell us about it! 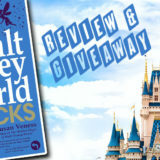 The best way to get a sense of this park is to take a walk through the park with us!